In the United States, NBC broadcast the AFC playoff games, CBS televised the NFC games, and ABC covered Super Bowl XXII. In the Saints' first playoff game in history, the Vikings dominated the game by recording two sacks, forcing four turnovers, and allowing only 149 yards. New Orleans scored first after Vikings quarterback Tommy Kramer's fumble on a bad snap led to Saints quarterback Bobby Hebert's 10-yard touchdown pass to wide receiver Eric Martin. Then, Kramer was sacked and the Vikings had to punt, but Saints returner Mel Gray accidentally hit the ball while trying to avoid it and the Vikings recovered on the New Orleans 27, leading to Chuck Nelson's 42-yard field goal. Kramer had to leave the game on the next drive with a pinched nerve in his neck, but the team would go on to win easily without him. Later in the quarter, they went up 10-7 when Anthony Carter returned a Saints punt a playoff record 84 yards for a touchdown. In the second quarter, backup quarterback Wade Wilson threw a touchdown pass to tight end Steve Jordan, and running back Allen Rice threw a 10-yard touchdown to Carter on a halfback option play. Saints kicker Morten Andersen cut the score to 24–10 with a 40-yard field goal, but John Harris' interception of a Hebert pass on the Saints 35 led to Wilson's 44-yard touchdown completion to Hassan Jones on the last play of the first half. Time had expired on the previous play, but the Saints were penalized for having 12 men on the field, giving the Vikings one more play with no time left on the clock. Carter, who had only returned three punts during the season, finished the game with six punt returns for a playoff record 143 yards, and also caught six passes for 79 yards and another score. Wilson finished the game completing 11 of 20 passes for 189 yards and two touchdowns. However, Seattle tied the game in the third quarter after kicker Norm Johnson made two field goals of his own. Later in the third quarter, Moon threw a 29-yard touchdown pass to Willie Drewrey to give his team a 20–13 lead. Houston later had two chances to put the game away in the fourth quarter, but Zendejas hit the uprights on a 52-yard field goal, and later missed a kick from 29 yards out. With only 1:47 left in regulation, Krieg started an 80-yard drive that included a 10-yard completion to Largent on fourth and 10 and eventually finished it with a 12-yard touchdown pass to Largent, tying the game with 26 seconds left. Seattle won the coin toss in overtime, but had to punt. On Houston's ensuing drive, Seattle defensive back Fredd Young appeared to intercept a deflected pass, one official ruled a catch but he was overruled, and the call was not overturned by replay review, allowing Houston to keep the ball and drive to Zendejas' game winning score. Largent finished the game with seven receptions for 132 yards and two touchdowns. Moon completed 21 of 32 passes for 273 yards, a touchdown, and an interception. It was Houston's first playoff win since 1979, added on to their first winning season since 1980. The Colts newly acquired running back Eric Dickerson rushed for 50 yards and received for 65 yards in the game,  but it was not enough to stop the Browns. Cleveland started off the game with a 15-play, 86-yard drive, converting five third downs on the way to Bernie Kosar's 15-yard touchdown pass to Earnest Byner. The Colts stormed right back, as quarterback Jack Trudeau threw completions for gains of 18 and 21 yards before finishing the drive with a 2-yard touchdown pass to tight end Pat Beach. Cleveland responded by driving from their own 35 to the Indianapolis 2-yard line, but on third down and goal, Colts safety Freddie Robinson intercepted Kosar's pass in the end zone. After an exchange of punts, the Browns took a 14–7 lead on Kosar's 39-yard touchdown pass to Reggie Langhorne with 1:51 left in the second quarter. Once again, the Colts responded with a touchdown of their own, moving the ball 59 yards in seven plays and tying the score on Trudeau's 19-yard touchdown pass to Eric Dickerson with 40 seconds left in the half. Indianapolis took the second half kickoff and stormed down the field, overcoming some blown plays along the way. During the drive, Trudeau was sacked for an 11-yard loss on second down and 11, but a defensive holding penalty negated the play and gave the Colts a first down. Later on, Dickerson fumbled the ball, but Trudeau picked it up and threw a 15-yard first down completion to Bill Brooks. Eventually, Indianapolis reached the Browns 20-yard line, but linebacker Eddie Johnson hit Trudeau as he threw a pass, causing the ball to go straight up in the air where it was intercepted by Wright at the 14. After the interception, Kosar completed five of seven passes for 65 yards while Byner rushed six times for 20 and capped off the drive with a 2-yard touchdown run, putting the Browns back in the lead, 21–14. Then after forcing a punt, Matt Bahr's 22-yard field goal gave the Browns a 10-point lead with just over 11 minutes left in the game. Following another punt, Byner fumbled the ball on a 25-yard run, but running back Herman Fontenot recovered the ball at the Colts 6-yard line, turning the play into a 41-yard gain. Three plays later, Kosar's 2-yard touchdown pass to receiver Brian Brennan made the score 31–14 with 3:44 left. Byner finished the game with 122 rushing yards, four receptions for 36 yards, and two touchdowns. Kosar completed 20 of 31 passes for 229 yards, three touchdowns, and an interception. Minnesota drove 77 yards on their opening drive, including an 11-yard run by quarterback Wade Wilson out of shotgun formation on third and 7, to score on Chuck Nelson's 21-yard field goal. Then after an exchange of punts, 49ers quarterback Joe Montana's completions to Roger Craig and John Taylor for gains of 18 and 33 yards helped advance the ball 74 yards in 10 plays to tie the game on a 34-yard field goal from Ray Wersching. 49ers safety Jeff Fuller returned an interception 48 yards for a touchdown early in the third quarter, but the Vikings stormed right back, with Carter gaining 30 yards on an end around play as the team drove 68 yards to score on Wilson's short touchdown pass to Hassan Jones, making the score 27–10. Later on, San Francisco coach Bill Walsh had enough of Montana and replaced him with Steve Young. The decision appeared to pay off, as Young hooked up with Craig for a 31-yard completion and later took the ball into the end zone himself on a 5-yard run, cutting their deficit to 27–17. But Minnesota countered with Wilson's 40-yard completion to Carter that set up Nelson's third field goal of the day. Wersching missed a 48-yard field goal on San Francisco's next drive, and the team would go into the final quarter still trailing 30–17. In the fourth quarter, Fuller was nailed with a 15-yard facemask penalty while tackling Vikings running back Allen Rice after he gained 19 yards on a screen pass, setting up Nelson's 46-yard field goal to put the Vikings up 33–17. Then defensive back Carl Lee intercepted a pass from Young, allowing Minnesota to run more time off the clock. Following a punt, Young led the 49ers 68 yards in eight plays to score on a 16-yard touchdown pass to tight end John Frank, but by then there was only 3:42 left in the game. Nelson later kicked a postseason record fifth field goal, this one from 46 yards, to completely dash any hope of a miracle comeback. In addition to his 227 receiving yards, Carter had a 30-yard carry and returned two punts for 21 yards. Vikings lineman Chris Doleman had two sacks. Wilson completed 20/34 passes for 298 yards and two touchdowns, with one interception. Nelson finished the day a perfect 5/5 on field goals, a notable contrast to his lowly 13/24 performance during the regular season. Montana was held to just 12/26 completions for 109 yards with one interception. Young had a solid performance with 12/17 completions for 158 yards and a touchdown, with one interception, while also leading San Francisco in rushing with 72 yards on six carries. It was a sign of what lay in store for 49ers fans, as they would watch him and Montana compete fiercely for the starting quarterback job until Young inherited the starting position when Joe Montana suffered a serious elbow injury during the 1991 preseason. Until the 2007–08 NFL playoffs with the Cowboys losing to the Giants, this was the last time the No. 1 seed in the NFC did not advance to the NFC Championship Game. After the Cowboys loss, three of the next four No. 1 seeds in the NFC would lose their first playoff game (2008 Giants, 2010 Falcons and 2011 Packers). The Redskins overcame a 14–0 Bears lead by scoring three touchdowns. Early in the first quarter, Chicago's Richard Dent forced a fumble from Washington quarterback Doug Williams that defensive tackle Steve McMichael recovered on the Redskins 30-yard line, leading to running back Calvin Thomas' 2-yard touchdown run. Later on, Washington running back George Rogers was tackled for a 1-yard loss while trying to convert a fourth and 1 from the Chicago 32-yard line. The Bears then drove 67 yards on a drive that consumed 9:04 and ended with Jim McMahon throwing a 14-yard touchdown pass to Ron Morris. However, Washington tied the game before halftime. First, Williams' 32-yard completion to Ricky Sanders on third down and nine and his 14-yard completion to tight end Clint Didier set up a 3-yard touchdown run by Rogers with 4:51 left in the half. Then after Chicago kicker Kevin Butler missed a 48-yard field goal, Washington got the ball back with 1:51 and made a big play when a late hit by cornerback Maurice Douglass turned a 13-yard catch by Sanders into a 28-yard gain. After two receptions by Gary Clark for 23 yards, Williams tied the game with an 18-yard touchdown pass to Didier. With 11:40 left in the third quarter, Redskins cornerback Darrell Green scored on a 52-yard punt return for a touchdown (Green injured his ribs hurdling over a Chicago defender en route to the end zone). Chicago responded with a 44-yard reception by Willie Gault that set up Butler's 25-yard field goal with 4:41 remaining in the quarter, but were shut down for the rest of the game. Green would return for just one play before leaving as a result of his injury, but Washington's defense still held on to their lead without him, intercepting three passes from McMahon in the second half. Early in the fourth quarter, Washington drove into the Bears' red zone and sent their special teams unit to attempt a 35-yard field goal. Backup quarterback Jay Schroeder, who was the holder on the play, called an audible for a fake field goal, but due the roaring crowd at Soldier Field, his receivers didn't hear the call. As a result, he had no one to throw to after the snap, and slipped on the 25-yard line while trying to run for a first down. Chicago then took over and drove to the Washington 14-yard line. But with just over nine minutes left in the game, McMahon's pass was intercepted by Barry Wilburn in the end zone. Later on, McMahon was intercepted again, this time by Dennis Woodberry at the Chicago 43. Three plays later, Washington attempted to put the game away with a quarterback sneak on fourth and inches, but Williams was stopped short with 1:13 left, giving the Bears one last chance to drive for a winning score. However, the Redskins defense again rose to the occasion, forcing Walter Payton out of bounds one yard short of the first-down marker on fourth down and 8. This was the final game in the Hall of Fame career of Payton, who rushed for 85 yards and caught three passes for 20 yards. With this win, Joe Gibbs advanced to his fourth NFC Championship Game in his seven years as the Redskins head coach. This game, along with the earlier win by the Vikings over the 49ers, would mark the first time the No. 1 and No. 2 seeds in a conference both lost. The feat has only been done twice more, in the AFC in the 2006–07 NFL playoffs with the Colts and Patriots beating the Ravens and Chargers, and again in the NFC in the 2008–09 NFL playoffs with the Cardinals and Eagles beating the Panthers and Giants. The Broncos jumped to an early 14–0 lead by converting two turnovers into touchdowns. On the second play of the game, Denver defensive back Steve Wilson recovered a fumbled lateral pass by running back Mike Rozier (the play was referred to as the "Stagger Lee" play after the 1923 folk song) at the Houston 1-yard line, setting up Gene Lang's 1-yard touchdown run. Then on the Oilers next drive, linebacker Karl Mecklenburg intercepted a pass from Warren Moon in the end zone, and the Broncos drove 72 yards and scored on John Elway's 27-yard touchdown pass to tight end Clarence Kay. Both teams exchanged field goals in the second quarter before Elway threw a 1-yard touchdown to Kay. Broncos receiver Vance Johnson caught four passes for 105 yards, but was injured in the game and had to miss the AFC Championship Game and saw limited action in Super Bowl XXII. Mike Harden; starting at strong safety in place of an injured Dennis Smith, was knocked out of the game himself with a broken right forearm. In a defensive battle, the Redskins played a little better by limiting the Vikings to only 76 rushing yards and piling up eight sacks among seven different players (Dave Butz, Kurt Gouveia, Ravin Caldwell, Dexter Manley, Charles Mann, Alvin Walton, and Clarence Vaughn). The Vikings string of playoff upsets came to an end in a game that proved to be just as hard fought and intense as Washington's 27–24 overtime victory over them in Week 15 of the regular season. Most of the remaining first half was a defensive struggle. With just over five minutes left, Washington running back Timmy Smith broke off a 34-yard run to the Vikings 31-yard line. But they failed to score again because of another missed field goal from Haji-Sheikh, this one from 47 yards. Minnesota took over and tied the game before halftime with quarterback Wade Wilson's 36-yard completion to tight end Steve Jordan setting up a 23-yard touchdown pass to Leo Lewis. In the third quarter, Redskins linebacker Mel Kaufman picked off a pass that had been deflected by Butz (which turned out to be the only turnover of the game) and returned it 10 yards to the Minnesota 17-yard line to set up Haji-Sheikh's 28-yard field goal. In the final quarter, Wilson got the Vikings moving on a 10-play, 52-yard drive, finding receiver Anthony Carter for 23 yards, running back Allen Rice for 15, and Jordan for nine. Minnesota eventually got a first down on the Redskins 3-yard line, but Washington's defense made a stand, stopping them on three consecutive running plays and forcing them to settle for Chuck Nelson's 18-yard field goal to tie the game. The Redskins then marched 70 yards in eight plays, including Williams' 43-yard completion to Gary Clark, to score on Williams' 7-yard touchdown pass to Clark and take the lead, 17–10, with 5:06 left in the game. Minnesota subsequently advanced to the Washington 6-yard line, with Wilson completing five passes on the way there, but on fourth down and four with 56 seconds left in the game, running back Darrin Nelson dropped a potential touchdown catch after being hit by defensive back Darrell Green, enabling the Redskins to run out the clock. Williams completed only nine of 26 passes for 119 yards, but threw two touchdowns and no interceptions, while his team gained 161 yards on the ground, 72 from Smith. Wilson completed 19 of 39 passes for 243 yards and a touchdown, with one interception. Carter caught seven passes for 85 yards, and returned four punts for 57 yards. Several early Cleveland miscues helped the Broncos jump to an early 14–0 lead. First, Cleveland kick returner Gerald McNeil was tackled by Tony Boddie on his own 12-yard line. Then after a sack by Denver lineman Simon Fletcher, Bernie Kosar threw a pass that went through the arms of Webster Slaughter and into the hands of linebacker Freddie Gilbert on the Browns 17, setting up John Elway's 8-yard touchdown pass to Ricky Nattiel. On Cleveland's next drive, fullback Kevin Mack lost a fumble while being tackled by Tony Lilly. One play later, Gene Lang's 42-yard run (surpassing the team's previous longest run of the season of 29 yards) gave Denver a first and goal situation. Elway eventually threw an incomplete pass on third and goal from the Browns 3-yard line, but a defensive holding penalty on Frank Minnifield gave Denver a first down at the 1, and running back Steve Sewell scored a touchdown on the next play. After the ensuing kickoff, Kosar completed a 25-yard pass to tight end Ozzie Newsome and a 19-yarder to Clarence Weathers on third down and 17 on the way to a 29-yard field goal by Matt Bahr two minutes into the second quarter. But Denver stormed right back on an 80-yard drive that ended with a 1-yard touchdown run by Lang, making the score 21–3. A sack by Denver's Rulon Jones helped force the Browns to a three and out. This time all the Broncos could manage was a missed field goal by Rich Karlis. But once again Cleveland could not move the ball and turned it over with a fumble from receiver Brian Brennan that was recovered by cornerback Randy Robbins. This time the Browns defense stepped up, sacking Elway twice and forcing Denver's first punt of the game. After that, Kosar's 24-yard completion to Slaughter set up a 45-yard field goal attempt by Bahr, but he sent it wide right as time expired in the half. Four plays into the second half, Browns defensive back Felix Wright intercepted a pass from Elway, setting up Kosar's 18-yard touchdown pass to Reggie Langhorne. But less than a minute and a half later, Elway threw a short pass to receiver Mark Jackson, who broke a tackle from Mark Harper and evaded a tackle attempt from Wright on the way to an 80-yard touchdown reception (the longest play in Denver postseason history), giving the Broncos a 28–10 lead. Cleveland responded with two consecutive touchdowns. First Kosar threw a 32-yard touchdown pass to Byner. Then Broncos returner Ken Bell muffed the kickoff and was downed inside his own 10-yard line. Following a three and out, McNeil returned their punt to the Broncos 42. Kosar then completed four consecutive passes en route to a 4-yard touchdown run by Byner, making the score 28–24 with less than four minutes left in the third quarter. Denver struck back with a 38-yard field goal from Karlis to give them a seven-point lead going into the final quarter. In the fourth quarter, the Browns drove 87 yards and tied the score with Kosar's 4-yard touchdown pass to Slaughter, but it was countered by Elway's 20-yard touchdown pass to running back Sammy Winder with four minutes left in the game. After the ensuing kickoff, the Browns got the ball on their own 25-yard line. Byner started out the drive with a 16-yard burst and a 2-yard run, and then Kosar completed two passes to Brennan for 33 total yards. Following an encroachment penalty on defensive lineman Andre Townsend and a 6-yard run by Byner, an offsides penalty on Denver linebacker Karl Mecklenburg moved the ball to the Broncos 8-yard line with 1:12 remaining in regulation. The Browns had moved 67 yards in just six plays covering 2:41. On the next play, Byner took a handoff and appeared to be on his way to score the game-tying touchdown. But he was stripped of the ball by Broncos defensive back Jeremiah Castille, and fumbled at the 2-yard line. The Broncos recovered the fumble (Castille made the recovery), gave the Browns an intentional safety, and went on to win, 38–33. Byner finished the game with 67 rushing yards, seven receptions for 120 yards, and two touchdowns. Elway finished the game completing 14 of 26 attempts for 281 yards and three touchdowns with an interception, and also rushed for 36 yards. His top target was Jackson, who caught four passes for 134 yards and a touchdown. Nattiel added five receptions for 95 yards and a touchdown. ^ "Vikings Pull Upset Saints Revert To Old Form In 44-10 Rout". OrlandoSentinel.com. January 4, 1988. Retrieved December 25, 2017. ^ Eskenazi, Gerald; Times, Special to the New York (December 26, 1988). "Oilers Win in Overtime". Retrieved December 25, 2017 – via NYTimes.com. 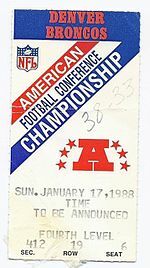 ^ Divisional Round - Indianapolis Colts at Cleveland Browns - January 9th, 1988. Sports Reference LLC. ^ Yowell, Keith (January 9, 2012). "1988: Anthony Carter Stars as Vikings Upset 49ers in NFC Divisional Playoff Round". fs64sports.Blogspot.com. Retrieved December 25, 2017. ^ Brennan, Christine (June 27, 2011). "Redskins Championships: 1987 Playoffs vs. Chicago". WashingtonPost.com. Retrieved December 25, 2017. ^ Harvey, Randy (January 11, 1988). "PRO FOOTBALL: THE PLAYOFFS : Oilers Roll Snake Eyes : Glanville, Houston Blow It All on First Hand and Then Lose Big to Broncos". Los Angeles Times. Retrieved April 7, 2017. ^ "Browns next on agenda for Broncos". Google News Search Archive. Spokane, WA: Spokane Chronicle. January 11, 1988. pp. 9, 11. Retrieved April 8, 2017. ^ Yowell, Keith (January 17, 2013). "1988: Redskins Defeat Vikings in Defensive Struggle for NFC Championship". fs64sports.Blogspot.com. Retrieved December 25, 2017. ^ "Flashback: Green's Stop Lifted Redskins". Redskins.com. Retrieved December 25, 2017. 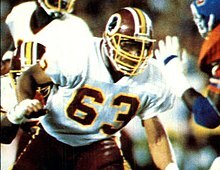 ^ "Great Redskins Drafts: A Look At 1983". Redskins.com. Archived from the original on September 30, 2007. Retrieved December 25, 2017.